Oh, to be a runabout child in a verdant countryside with four distinct seasons, all with their own pleasures! Four children and a dog, all friends, frolic playfully through fall and spring, summer and winter, finding fun whatever the weather. They watch the winter turn their world white, the woods becoming crystal gardens of frosty ice. and then they watch the season morph into proto-spring. Sometimes clear, bright and glowing. So much melt. The mud is growing. 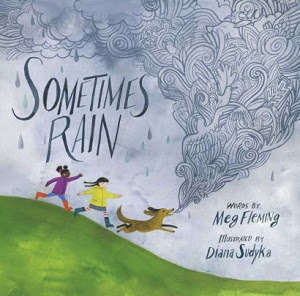 In concise and lyrical couplets, Meg Fleming's new Sometimes Rain (Beach Lane books, 2018) follows the children's free play through the seasons in language both comic and poetic, but always moving, as the youngsters find beauty and glorious fun in the fields, woods, pond, and beach as the each season melts into the next. Artist Diana Sudyka's lovely illustrations also move steadily through space, left to right, the children front and center, small, not quite dwarfed by the great outdoors, but an integral part of it, moving with their planet through the joyful time of their lives, until they eventually come . . . Always ready, stay or roam. This is a great read-aloud book, the kind that will end with mostly quiet smiles, a good choice for poetry units and the changing of the seasons. "This poetic celebration of the impermanence and unpredictability of seasons is a delight for pluviophiles and heliophiles alike," quoth Kirkus Reviews eruditely.